A team of scientists, including two from the University of Roehampton, has discovered that basking sharks, hundreds of which live off the shores of Cornwall, Ireland and Scotland, can jump as fast and as high out of the water as their cousin, the famously powerful and predatory great white shark. Basking sharks, the second largest fish in the world reaching lengths up to 10m (33ft), have previously had a reputation for being slow and languid as they scour the sea for their staple diet of plankton. The research used video analysis for both species to estimate vertical swimming speeds at the moment of leaving the water. Furthermore, they fitted one large basking shark with a data recording device to measure speed, movement and which also stored video. To achieve this breach, the basking shark exhibited a six fold increase in tail beat frequency and attained a top speed of approx. 5.1 m/s. This is more than twice as fast as the average competitor in the Olympic men’s 50m freestyle swim. The videos from boats and the land of both basking sharks and great whites breaching showed similar speeds of breaching in other individuals. 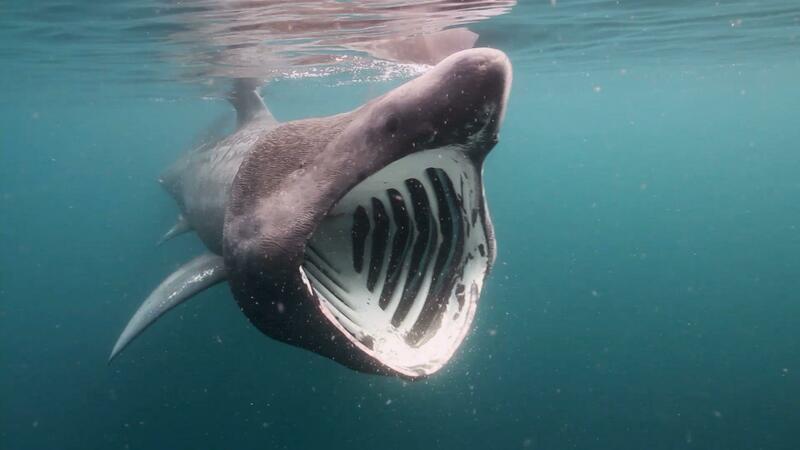 The basking shark videos were recorded in 2015 at Malin Head, Ireland. The white shark videos were recorded in 2009 at two sites in South Africa, during predation attempts on Cape fur seals using seal shaped decoys. The research team comprised Queen’s University Belfast, University of Roehampton, Trinity College Dublin, University of Cape Town, Irish Basking Shark Study Group and the South African Institute for Aquatic Biodiversity.